MANILA, Philippines – (Updated July 3) The June 2018 Agriculturist board exam results, which include the complete list of passers, top 10 (topnotchers), top performing schools and performance of schools are released on Tuesday, July 3 or in five (5) working days after the exam. As announced, 1,689 out of 4,428 (38.14%) successfully passed the exam. Agriculturist board exam was administered on Sunday to Tuesday, June 24, 25 and 26, in the cities of Manila, All Regional Offices and Zamboanga. From July 12 to 13, registration for the issuance of Professional Identification Card (ID) and Certificate of Registration will be done on-line. Please go to http://online1.prc.gov.ph and follow instructions for initial registration. Agriculturist board exam's verification of ratings (passers, non-passers and removal) can be done online. To pass the licensure examination for Agriculturists, a candidate must obtain a weighted general average (WGA) of 75% with no grade lower than 60% in any give subject/s. However, if an examinee obtains a WGA rating of 75% or higher but obtained a rating of below 60% in any given subject/s, he/she shall be allowed to take the examination in the subject or subjects where he obtained a grade below 60% only once. In accordance with PRC Resolution No. 2017-1068, the target release of June 2018 Agriculturist board exam results is on Tuesday, July 3 or in five (5) working days after the exam. In the November 2017 Agriculturist board exam, results were announced online in five (5) working days after the exam. PRC named 2,883 out of 7,537 who passed the tests. University of the Philippines (UP) - Los Baños was the only top performing school with 99.22% or 128 out of 129 passed the exams. In the April 2017 exam, results were released in four (4) working days after the last day of tests. 927 out of 2,938 passed the series of exams. None of the schools qualified for the top performing list by PRC. From time-to-time, monitor updates on release of results and other announcements on The Summit Express. 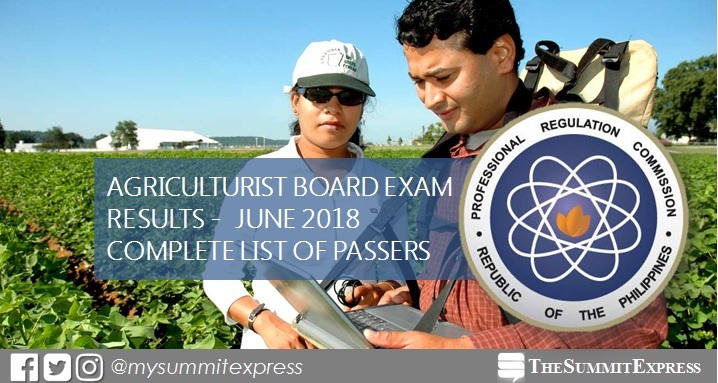 Our partner exam results portal PRC Board News will also have a dedicated page for the recent Agriculturist board exam. Good luck to all takers!